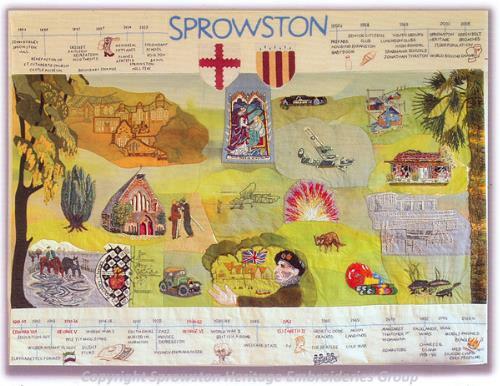 These images are taken from Threads of Time, a community tapestry comprised of four panels created by Sprowston residents depicting the history of the area. What a crammed landscape - many buildings have been portrayed here in multiple designs, and many have been missed. The laburnum to the left reminds us of suburban gardens, not heathland, and the palm to the right leads us on into global warming. Industry and two world wars have changed life and we enter the living memory of some residents. This panel covers a shorter time than the others. Now 17,000 live here! After 150 years of Methodism, there's an added Chinese congregation. 'Park and Ride' helps traffic. Sprowston Community High School has a new four-storey building and Arts Specialist Status. Sprowston moves on and as newcomers settle down, they'll be curious about this area, and also make their mark on it. Welcome to the future! St Cuthbert's Church was funded by John Gurney of Sprowston Hall in 1886. Blinded as a result of a fall from a horse, he still became Norwich Mayor four times. He came from the Quakers at Earlham Hall and Elizabeth Fry was a forebear. The family founded Barclays Bank and he commuted in a little dog cart. 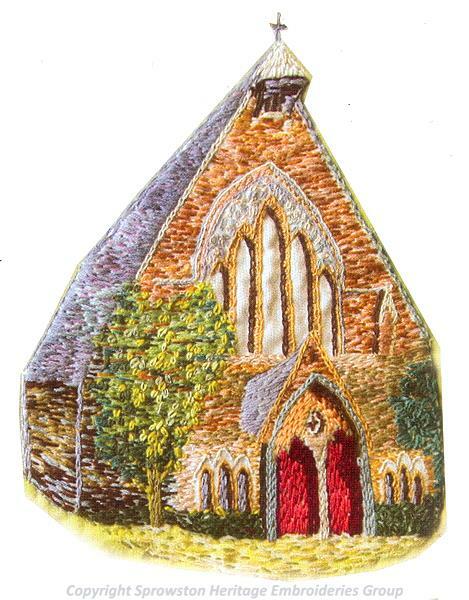 The tapestry also features a Bronze Age cemetery, St Mary and St Margaret's Church, Sprowston Mill, the legend of White Woman Lane, Sprowston Hall and Mousehold Heath aerodrome.